The late, longtime New Yorker critic Pauline Kael was said to have expressed confusion over Richard Nixon's landslide re-election in 1972  because no one she knew had voted for him. To borrow that notion, conservatives today imagine that everyone views the current occupant of the White House as they do: Barack Obama is the worst President ever. Conventional wisdom posits that this potent right-wing, anti-Obama sentiment will diminish the President's power  enough for Republicans to vanquish Democrats in November, regain control of Congress and weaken the incumbent for 2012. But this myopia has been created within an electronic cocoon of Fox News, talk radio, conservative websites and rhetoric from Republican leaders, all passionately reinforcing the message that the Obama Administration is disastrous on a historic scale. It's a message that is being transported as gamely by rank-and-file Republicans as it is by erudite conservative columnists with national readerships. Of course, in this modern age of extreme polarization, only one President these past 30 years (George H.W. Bush, the père) has escaped the regular damning hyperbole of "worst ever." But the condemnation of Obama seems somewhat more extreme. The blue-red divide, by almost every measure, has gotten worse, and the ubiquity of electronic media spreads intense political and cultural disdain in the blink of an eye. The always enlightening Google reveals that typing in "Obama worst president ever" yields 3.4 million results, vs. 1.8 million for "Bush worst president ever" and 1.2 million for Clinton. That stat seems representative of where we have arrived as a nation and illustrative of the relationship between the incumbent President and his critics. Conservatives from the upper echelons of elected officials in Washington and state capitals, presidential-candidates-in-waiting such as Sarah Palin and Mitt Romney, 2010 stars such as Rand Paul, and testy Tea Party activists all believe they have an objective case to rank Obama as 44th out of 44 Presidents. Not only do they think his policies are misguided and out of step with America's greatest traditions of individual liberty and free enterprise, but they are convinced that his relative lack of experience and youth confirm the pre-election suspicions that he is not up to the job. 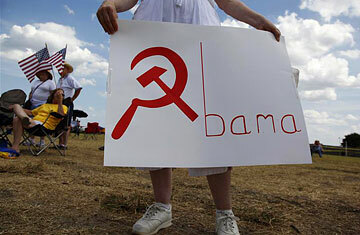 The times of crisis in which Obama has governed only exacerbate the situation. It doesn't take a degree in psychology to recognize the explanatory formula "economic/environmental/international crises + search for a scapegoat = widespread Obama hatred." And it is evidence of how much matters have deteriorated that it's impossible to imagine conservatives rallying around Obama in the face of a new disaster, like the left did (albeit briefly) after Sept. 11 for President George W. Bush. Even if the President were to repel a Martian invasion, the right's reaction would likely be the same as it was after the Christmas Day bombing attempt, or the failed Times Square attack, or the current oil spill: denigration of Obama's competence, suspicion of his motives and implicit (or explicit) hope for his failure. The experiences of Ronald Reagan and Bill Clinton are instructive. Like Obama, they accomplished a fairly high percentage of their campaign promises, even as their enemies deemed them failures from those Presidents' first days in office. Both Presidents benefited by staying focused and on course, sidestepping the increasingly hostile rhetoric thrown at them by their foes. Clinton at times would explode, letting such verbiage get his goat, but Reagan did not, and in that sense, he is Obama's closer analogue. Obama has become prickly at times during these past 16 months, but he is more apt to brush off the barbs as proof positive that the opposition is losing  and losing it.